Best-Seller - inlclude Digiarty's 4 popular software - DVD Ripper Platinum, VideoProc, DVD Copy Pro, MediaTrans. All-in-one solution to process DVDs, videos and audios: Convert, resize, cut, trim, merge, crop, rotate, subtitle, deshake, denoise videos; download video/music/playlist from YouTube & 1000+ sites; rip and backup DVD discs; record video with screen or webcam; manage and transfer files between PC and iDevice without iTunes, etc. Pack with three DVD and video tools - WinX DVD Ripper Platinum, WinX DVD Copy Pro and WinX HD Video Converter Deluxe. It offers an ultimate solution to rip DVD to AVI/MP4/iPhone/iPad/Android, clone DVD to DVD/ISO image, and convert HD/regular videos. All features maximally upgrade your multimedia experience. Pack with WinX DVD Ripper Platinum, WinX HD Video Converter Deluxe, WinX DVD Copy Pro and a free gift. Clone/rip/burn DVDs, convert DVD and videos to AVI, MP4, MPEG, WMV, MOV, iPhone, iPad, Android and more, download UHD video & music from 300+ online websites, and also lets you play DVD, HD video and music at ease. 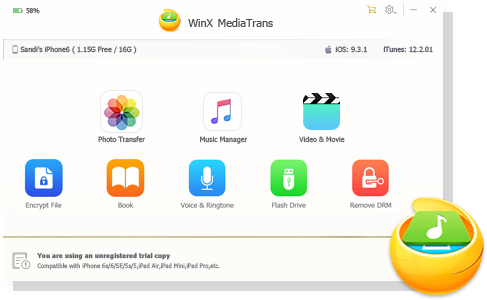 A premier solution for iPhone/iPad users to transfer photos, music, videos, iBooks and other iOS files between iDevice and PC without iTunes. Plus download online videos, rip DVD & video to MP4/H.264/iPhone/iPad. Pack with WinX DVD Ripper Platinum and WinX HD Video Converter Deluxe. Getting this pack means you will have DVD ripper, DVD VOB converter, HD video converter and YouTube downloader. The built in new technologies give you blazingly fast DVD/video converting speed and optimum image/sound quality. Pack with WinX DVD Ripper Platinum and WinX DVD Copy Pro. Prepared for DVD fans to digitize & back up DVD to DVD disc, DVD to ISO image, DVD to MPEG and copy DVD chapter, etc. Plus rip DVD/DVD ISO to AVI, MP4, FLV, WMV, iPhone, iPad, Apple TV, Android, etc, back up DVD to PC & USB. Pack with WinX HD Video Converter Deluxe and WinX DVD Author. Save your favorite video collections to DVD, no matter they are HD videos MKV, AVCHD, M2TS, MOD or regular videos AVI, MP4, MPEG, WMV, MOV, FLV. The video converter can also convert video to iPhone, iPad, Android, PSP, Xbox, etc. Pack with WinX DVD to iPhone Ripper and WinX iPhone Video Converter. This pack eliminates the frustration of iPhone video conversion by ripping DVDs to iPhone, convert videos MKV, M2TS, AVCHD, MOD, TS, AVI, MPEG, MOV, FLV, 3GP, etc to iPhone (iPhone 7/7 Plus, iPhone 6S/6S Plus, iPhone 6/SE/5S). Pack with WinX DVD to iPad Ripper and WinX iPad Video Converter. It allows you to rip DVD and convert videos to iPad 2/3/4/Mini/Mini Retina/Air. Thus, homemade & purchased DVDs, HD video MKV, MTS, AVCHD, MOD or regular video AVI, MPEG, WMV, FLV, RM and more media files can be played on iPad.